I can’t believe this is the last week! I remember when I started this blog I thought that it was going to be difficult to find a new food to try every week. But it’s been super easy and I even exceeded my goal of 52 new foods and here we are at the very last week. Oftentimes at work, a group of us eat lunch together. 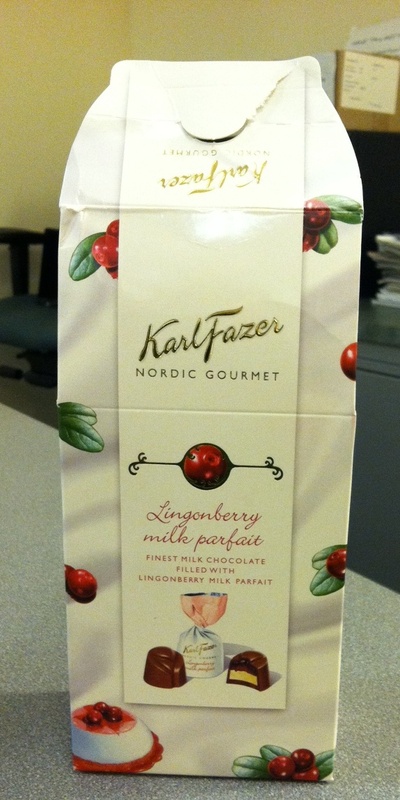 Just before Christmas, my friend Shani brought in a package of chocolate covered lingonberries to share with the group. She had gotten them as a gift from her family, who live in Finland. Maybe this was cheating a little, since the lingonberry was covered in chocolate, but it was delicious! Lingonberries are popular in Scandinavian countries and are distant cousins of cranberries. They are smaller and juicier than cranberries, but share some of their tartness. Lingonberries are also often made into jam, which isn’t terribly easy to find in the US but may appear in some grocery stores or ethnic markets. Like their cranberry cousin, lingonberries are known to help fight urinary tract infections. They also are chock full of antioxidents. I’ll be on the lookout for lingonberries in their pure (non-chocolate covered) form and also for a jam – I would like to try both.